Hello TFU-Fans. 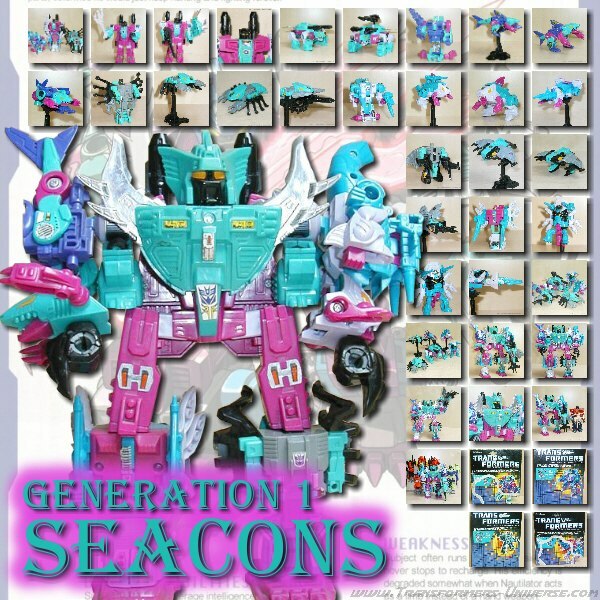 Today I want to tell you about the Classic Seekers, which include three figures from the 2007 Botcon: Thundercracker, Dirge, and Thrust. But I don't want to bore you, so let's get right to the important part: the pictures. Here you can see all six of the Seekers standing in a nice, orderly row, ready for inspection. Starscream is the first, seeing as he is the Seekers' commander. You can easily see that his face remained unpainted in the Hasbro variant, God alone knows why. Maybe they wanted to save on paint. Whatever. He was the first Seeker to come out as part of the Classics series. His colour scheme is close to the original in most ways, but for some people it's not quite the proper G1 colours. That's why Takara/Tomy is trying to get closer to G1 and they took the time to paint Starscream's face as well. Let's look at Skywarp. As you can see here Hasbro did learn something and his face is painted. It looks a lot better, the face is far more defined that way. Skywarp was available exklusively in a two-pack along with Ultra Magnus, he couldn't be bought on his own. The pack was a Toys R'Us exclusive. As you can see the violet contrasts nicely with the rest of him. For some people that might still not be enough and those are waiting anxiously for the Takara/Tomy version. That one will feature a somewhat colder tone of violet, closer to the G1 version. Thundercracker was a Botcon exklusive figure, available only at Botcon 2007. The figure was limited to 1000 pieces. But there is hope for all those who didn't get a chance to procure one on ebay, because Takara/Tomy is bringing out this figure as well. It will once again be an exclusive, but not a limited production run this time. But back to topic. Thundercracker, too, managed to get his face painted and his colour scheme is pretty close to his G1 days. Ramjet was the second figure that came out in the Classics series and he even got an IDW comic dedicated to him, called Transformers Ramjet Spotlight. The figure isn't exactly a close homage to the G1 version, but the colour scheme is very original and pleasing to the eye, especially in robot mode. But for all those who are not satisfied with Classics Ramjet, he's also available in G1 colours, as issued by Takara/Tomy, and available in every good online store. Dirge is the second of the Seekers available exclusively at Botcon 2007 and even though you can't tell at first glance, he's little more than a straight repaint of Ramjet. But the colour scheme is very close to the G1 version. Thrust is the third and last Seeker from Botcon 2007 and possibly the most original repaint/remold among the Seekers. His wing design really stands out, especially in jet mode. But fans from the G1 days will remember him looking very similar back in the day and his colour scheme is also a very close match. Here you can see all six Seekers in jetmode. The right picture offers a better view of the various colour schemes. You may note that those from the Classics series are not terribly G1 accurate, but the Botcon 2007 figures come a lot closer to resembling their ancestors. So in conclusion I can say that these figures, even though most of them are simple repaints, are a must-have for every collector. And so they get a perfect score from me: 10 out of 10.